As I looked into how to start my own website, I ran into many programs and systems that would teach me how to do it. Since I had no experience building sites, I needed something that would take me by the hand and show me step by step, in easy to understand language, how to get it done. Their process was simple, even for a beginner like me, and not only did they help me build these pages, they helped me start my business! Yes, they are showing people like you and me every day, how to turn a hobby, skill, or passion into profitable businesses by building a website... that works. I am amazed at what I have been able to accomplish with a few hours a week, working from home on my spare time and sharing a topic that I absolutely enjoy. Making some money along the way has been the icing on the cake. So, what was it like to get started? I tell you here how I did it, and how anyone can do this too. With SBI you get more than just a "site builder." You don't need to worry about the "technical" side of it as everything you need is provided and the functions are completely automated. Does your site concept have acceptable profit potential? Selecting your site concept is not always as simple as you might think. 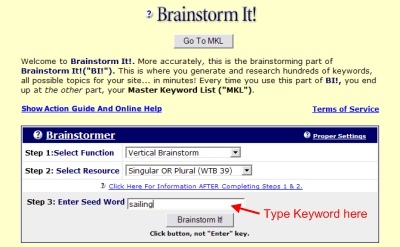 Brainstorm It! is SBI's powerful tool that helps you verify that your idea is a viable one. It also helps you find topics related to your niche that will pull in traffic and generate income. With the help of Brainstorm It! You can determine the overall profit potential of your topic, SBI guides you all the way until you identify the best Site Concept for you. 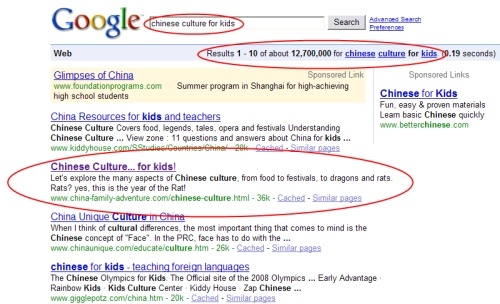 With advertisements: You probably have seen the "ads by Google" throughout our pages. We make money when our visitors click on those links. Our advertisers love it because it sends them qualified leads. With affiliate sales: Throughout our pages you will find links to products such as Travel Guides, Children's Crafts, Tours and Excursions, and Chinese Cultural Products. The links bring our visitors to the vendors' sites. We make a small commission from their sales. We do not carry inventory, worry about shipping, make the travel arrangements... The vendors do. But there are many other ways successful SBIers are building their businesses. SBI shows you how. Monetize It! like Brainstorm It! is another tool that helps you to identify and diversify your Web income. The key is to never be dependent on any one source of income. So, with all the initial planning out of the way, you are finally ready to register your domain name, that is, your website finally has a "home". This comes on Day 5 of the Action Guide. I wish I could tell you all the details about site hosting, domain registration, and submissions to the Search Engines, but I can't, that is all included and handled by SBI. First you develop your site's "look". 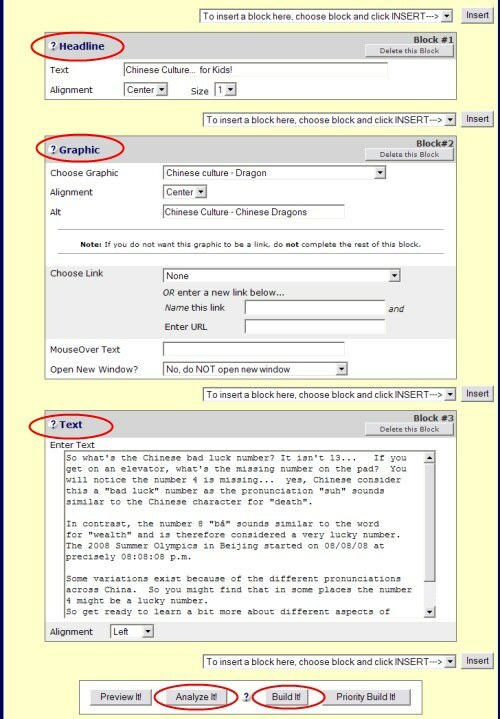 SBI's Look and Feel Selector provides fully customizable, easy-to-use templates like the ones you see on the left. There are hundreds of designs for you to choose from. You can change things around such as colors, fonts, alignments, etc. to suit your needs. 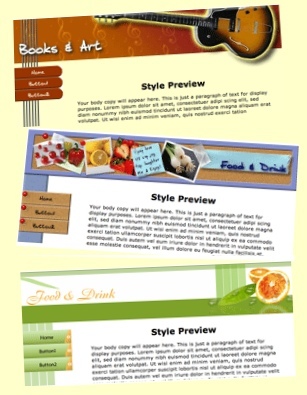 You can create a professional-looking website, even if you have no design skills. When I first got started, I just took one of their "ready-made" templates. As I got more confident with my "design skills" I created my own logo and layout, which is the one you see now. It is a fun learning process when you have guidance all along the way. Now it is finally time to create your first page... Start typing, yes, that's it, just start typing... The Block-by-Block builder makes page creation as simple as riding a bike with training wheels. Since I had no idea about HTML (I still don't know what it stands for), I used the block builder to create my first pages. As I learned and got the hang of it, I took the training wheels off and started uploading my own HTML. Click on Analyze It! to make sure your page is built in a way to score high with the search engines. SBI will help you fix any critical problem or deficiency. You will see below why this is important. SBI allows for maximum creative flexibility for all skill levels. ...How will people find your Website? You need to announce your site and new pages to the likes of Google and Bing. If you don't submit your pages to the Search Engines, you won't get into their databases, that means, you are invisible on the Net. SBI does it all automatically, a huge time saver. When you do a search on Google, how many pages of results do you look at? Normally we look at the first few positions before we click away. Your website has to beat the other 12+ million sites that share your concept and get on that first page of results. 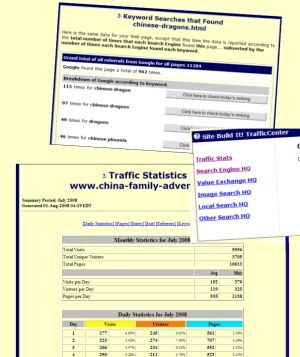 So what is the key to top rankings and generating traffic? This is an ongoing process and it doesn't happen overnight. 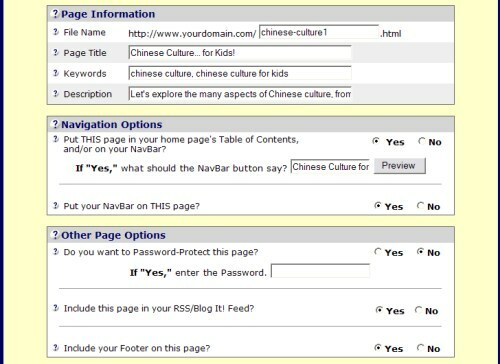 Basically you need to please two kinds of visitors: your human visitors and the search engine spiders. So welcome to Days 7 to 9 of the Action Guide. There are some basic steps you need to follow, such as developing an inbound link program in order to establish credibility with the search engines and establish a presence in social media. Again, SBI has excellent tools and guidance for you to accomplish this. There are many features provided by SBI that allow you to build stronger bonds with your visitors. You can easily build up your mailing list, set up an ezine or site blogging. Many services charge you extra for these features but not with SBI. Your Traffic Stats and Search Engine ranking reports let you see how your pages are doing, what your visitors like most, and how they are finding you. Having access to and learning to interpret this kind of information is crucial, since it helps you determine how to increase traffic and monetization. Most pros don't have easy and reliable access to this type of data. But again, SBI will give you all that and most important, will teach you how to use the reports. As you continue to deliver excellent content that your visitors come back for and keyword rich pages that the Search Engine spiders like, your site will start ranking better, your traffic will start to build, and you will be at the final stage of the process. So you made it to Day 10 of the Action Guide and are finally ready to put in practice the Monetization Plan you developed during the planning stage. Whatever you strategy is, SBI will likely have the tools to enable it, whether in the form of a shopping cart or some other third party resource that can be easily plugged into your SBI site. It is simple in the way that all the tools and guidance required for you to succeed are there for you to grab them. You bring the BAM -the brains and motivation. Building the website is a snap. Building the business is a different story. It takes time, commitment and dedication. You might not see results right away, and there is that learning curve at the beginning. But trust that the process works, and your efforts will pay off hugely in the future. I admit I've had my days, and for that, I am thankful that we have the SBI Forums. These are fellow SBIers who are in the same place as you... building their businesses in the same way. They provide friendly and helpful support when you hit a road block. Whether you need just some inspiration or you bump into a technical snag, you are never alone on this journey. They helped me get the videos on my site, and now that I'm looking into translating my website to different languages, I know there will be someone willing to lend a helping hand to get my multi-lingual site set up. The forums are open for everyone to help and be helped. That in itself, is priceless. How much does SBI cost? What's the bottom line? The price is US$299 per year and it includes all the tools and resources you need to have a succesful site. There are no hidden costs, no upgrades, no catches. SBI has a no-risk, 90-day full money back guarantee. You can try it out, and if you decide it's not for you, you get your money back, no questions asked. You have nothing to lose. And here is a comparison of what you get with SiteBuildIt vs. other major web building and hosting solutions. ...and Start Making a Living from Doing What You Love! Whether it's some extra income to fund your travels, college expenses, quit your day job, or anything else you want in life... It can be done. It really is possible to turn any hobby, skill or passion into a profitable online business. I did... and so can you. Take the Video Tour. This could be the most important 30 minutes you'll ever spend online. Amazing how time flies... It's been a few years since I first wrote this page and much has changed. SBI has a newer slicker platform which has added so many new tools and flexibility, the improvements just keep coming. The online world has also changed, and SBI has kept pace along the way: a new Social Media module and mobile capabilities are only some examples. What has remained constant? Amazingly, the price, it's still $299, regardless of how many new tools or improvements are made, the price is still the same. On a personal level, I feel even more convinced now than I was when I first set out on this journey, this really can be done, the effort does pay off. 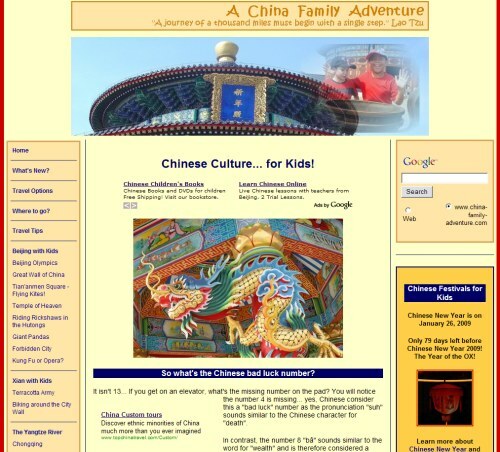 Our original site, China Family Adventure is thriving and has been a source of so much joy and so many fantastic opportunities. Together with some friends, we have started a couple of new sites which are also showing good promise. One is a spin-off of this site, www.hong-kong-traveller.com, drawing from our experience with China Family Adventure, the second time around was much much easier! Our newer site is actually from our second home In Florida, www.MiamiScapes.com, where we are looking forward to discovering and promoting two other passions of ours: the richness of the Everglades and the underwater reefs of the Florida Keys. The journey continues, and I just know, the best is yet to come! If you have any questions or doubts, I am only an e-mail away!